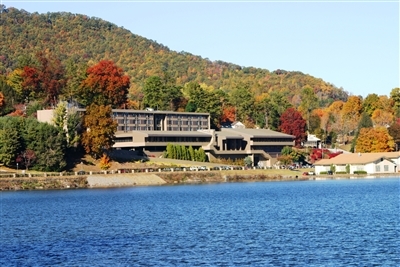 The Terrace Hotel at Lake Junaluska is closed this winter to allow renovations to meeting spaces and its 105 guest rooms. It will reopen in April. Photos from Lake Junaluska Conference and Retreat Center. WAYNESVILLE, N.C. – The Lake Junaluska Conference and Retreat Center, tucked away in a scenic corner of the Western North Carolina mountains, has embarked on one of the most ambitious renovation projects in its history. The Terrace Hotel will be closed this winter to allow for a $3.2 million upgrade to its 105 guest rooms and front desk, as well as new carpet and paint in the hotel’s meeting spaces. It is scheduled to reopen in April, in time for the retreat center’s biggest season that starts in May and runs through the fall. The renovation is among early steps toward realizing a $40 million revitalization plan for Lake Junaluska, which celebrated its centennial anniversary last year. Earlier projects in the plan included construction of a new fishing pier and boat launch, as well as renovations to the playground and youth dining hall. The hotel’s closing will not affect winter programming for youth groups, said the retreat’s marketing manager, Stephanie Drum, in an email to Florida Conference Connection. Guest rooms at The Terrace Hotel will sport a refurbished look inside to complement the mountain lake vista outside. 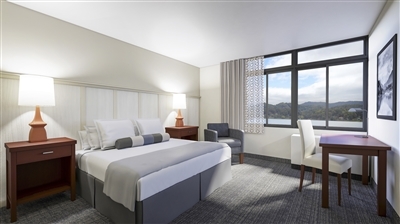 Perched on the edge of Lake Junaluska, The Terrace is a popular choice because of the view and its full-service amenities, including Internet, a fitness center and an aquatic center, Drum said. However, other lodging options remain, including the historic Lambuth Inn, Lakeside Lodge, apartments with kitchenettes and dormitory-style lodges. The center also has an RV campground, but that is traditionally closed in the winter, Drum said. Fundraising for a $14 million refurbishment and upgrade to the Lambuth Inn is underway. The inn is listed on the National Register of Historic Sites. Lake Junaluska was founded by Methodists in 1913 and remains a Christian retreat center with ties to The United Methodist Church. For information, visit www.lakejunaluska.com.